A great way for students to practice their multiplication and division facts! Students use a paperclip to spin a fact family on the doodlebug spinner and write the 3 numbers on the top lines. Then, they write the fact family on the lines. There will be 2 multiplication and 2 division facts in each box. 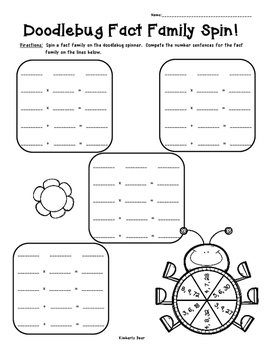 This sheet can be copied double-sided or use as 2 separate activities on 2 different days. A fun, engaging and meaningful activity to use as a center, seatwork practice activity, homework, morning work, etc. !